As soon as other insects start buzzing through the air each spring, dragonflies emerge to hunt them down. After spending the winter underwater as nymphs and hunting small aquatic animals, throughout the spring and summer, these colorful predators come to the surface, molt, and become airborne. By this time of year, they are ubiquitous at BBG and elsewhere across the Northeast. They will spend the rest of the summer and fall hunting other insects and looking for mates. Dragonflies come from an ancient lineage—fossil specimens from more than 300 million years ago look just like modern species. They are easily recognized by their pairs of long, slender wings, elongated abdomens, and relatively huge eyes. 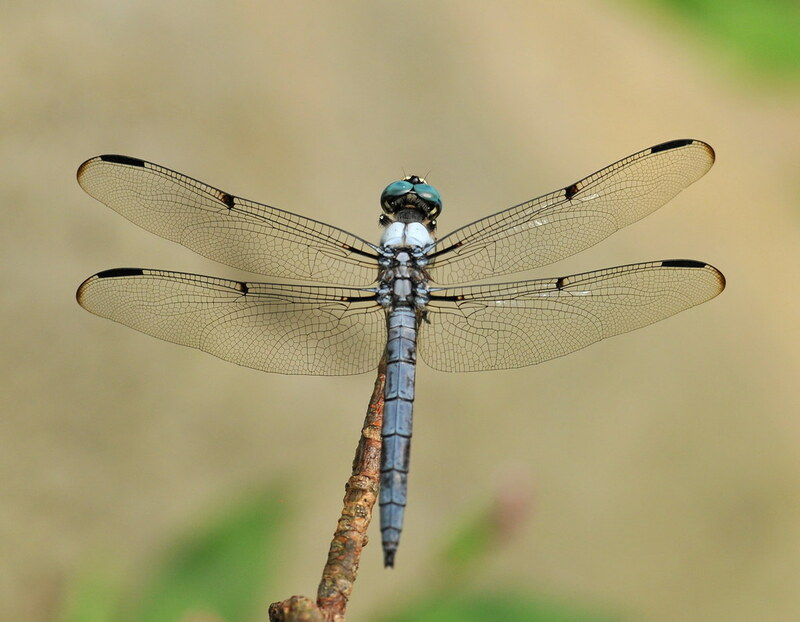 This great blue skimmer (Libellula vibrans), above, displays all these features. 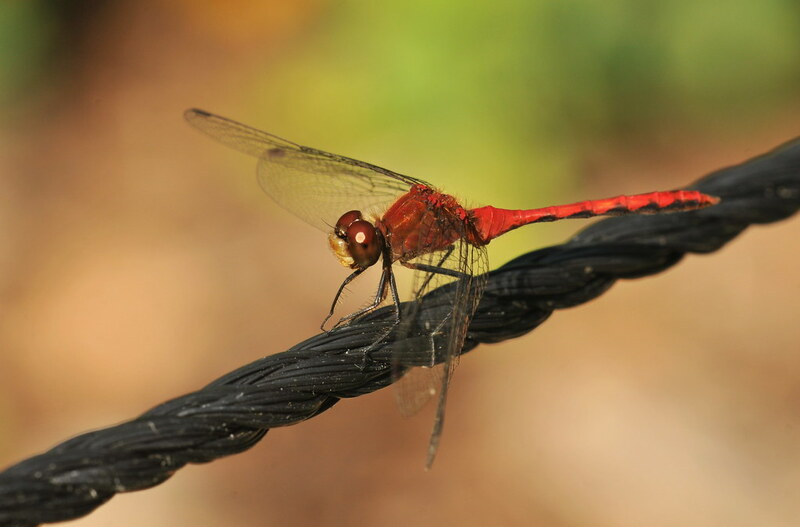 Look for dragonflies and other insects at BBG on our Sunday Nature Walk! Dragonflies make up the suborder Anisoptera (from anisos, "uneven," and pteros, "wings"), a reference to the fact that the front and hind wings are different widths. This distinguishes them from the closely related damselflies, or Zygoptera, whose wings are of nearly equal size. An even easier way to tell them apart: Damselflies almost always fold their wings back along their body while perched. Hunting on the wing requires extraordinary agility and precise vision. This meadowhawk (Sympetrum species) has eyes that cover most of its head. Dragonflies’ eyes are composed of tens of thousands of individual lenses or ocelli—many more than those of most arthropods. This feature and the way their eyes wrap around their head allow them to form a detailed picture of their entire surroundings, so they can evade predators below and behind while searching for and tracking prey. Dragonflies are very territorial. Some will patrol their hunting grounds ceaselessly, chasing away intruders. Others will return to exactly the same perch time after time, pushing away anyone else who tries to land there. This twelve-spotted skimmer (Libellula pulchella) has found a perch in the Native Flora Garden from which it has a clear view of its hunting grounds. To take this photo, I moved close to its perch while it was away, then got the shot when it returned. Dragonflies begin their lives as aquatic organisms, and they often continue their lives near water—freshwater ponds and lake shores in this region usually have large populations. Adult dragonflies, however, can live wherever there is prey. Open meadows can also be good hunting grounds. 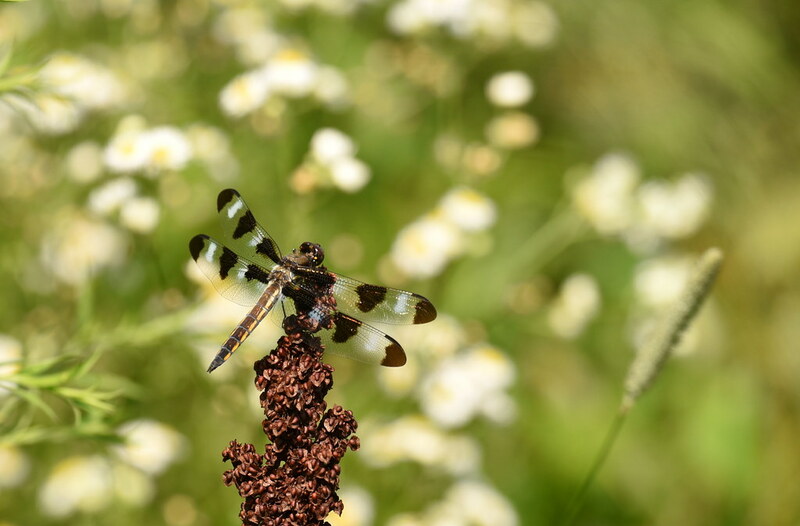 Look for green darners, meadowhawks, and black saddlebags at BBG, hunting over the Monocot Border or in the tall-grass prairie of the Native Flora Garden. 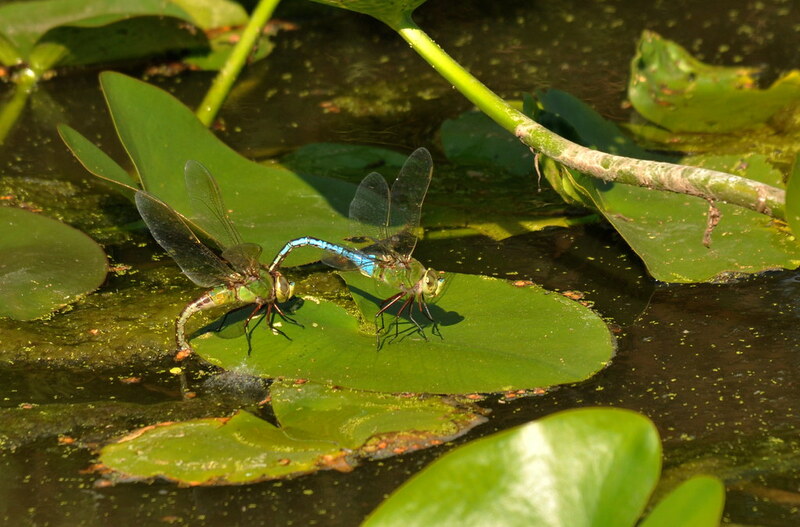 I photographed this mating pair of green darners (Anax junius) at Lily Pool Terrace. They may live here their whole life, but they could also migrate as far as Texas. The species is one of only a handful that can undertake such a journey. Dragonflies often exhibit sexual dimorphism. This means that the males and females look markedly different. 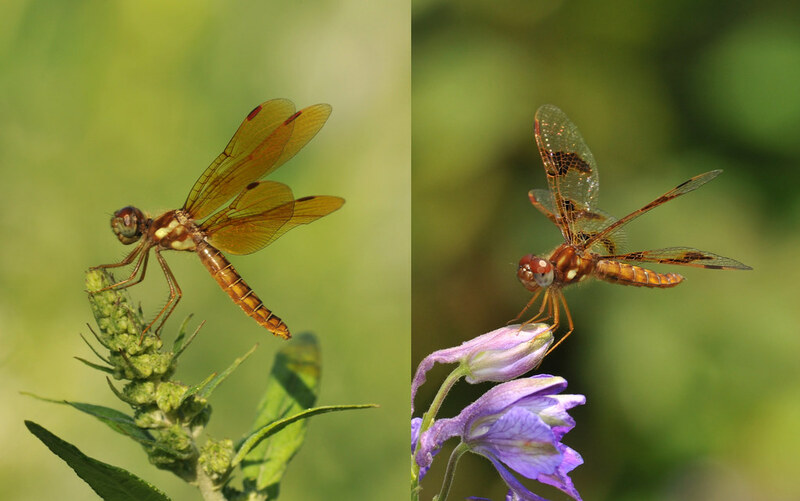 The male eastern amberwing (Perithemis tenera) on the left shows the eponymous amber-colored wings, but the female of the species, right, has mostly transparent wings with large, dark spots. Males are often more brightly colored in order to attract mates, whereas females are more drab and hence better camouflaged. 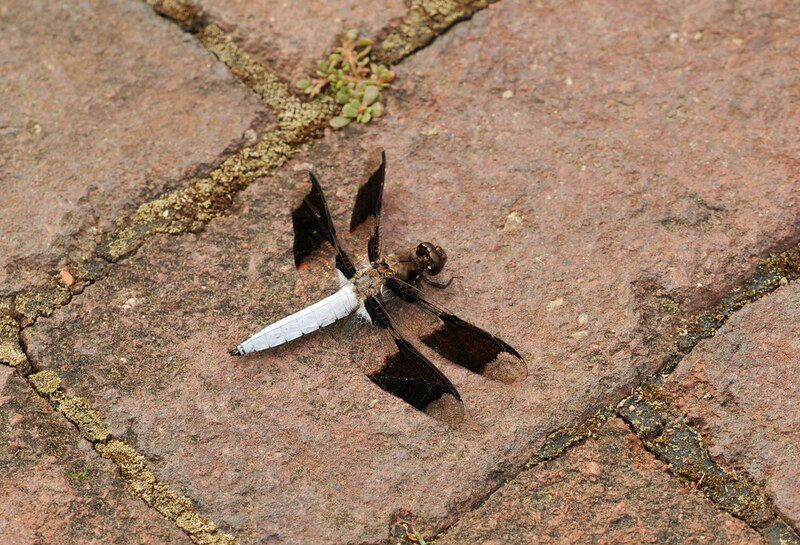 While most dragonflies prefer a high perch on top of a reed, twig, or leaf, the common whitetail (Plathemis lydia) will often rest on a rock or on the ground. This brightly marked male was resting along a brick path in the Cranford Rose Garden in late June. Male whitetails defend their territory from invaders of the same species by engaging in a visual duel, and individuals that display a brighter abdomen are able to maintain a larger territory.